With the Old Home that is being sold, you will want to walk through with your realtor, and determine if things should be updated that will give you the greatest return on your investment, which will result in getting you more money. Meaning if you spend a $100 upfront on changing out handle pulls in the kitchen & bathroom, will this add substantial value to the home? In our example, it was definitely worth it because the kitchen & bathrooms were extremely early 90’s and a simple change of the brass handles to nickel handles made a world of difference. In our real life example we ended up spending around $5,600 to do mostly cosmetic upgrades for this house that was built in 1993. Some of the things done were pressuring washing the exterior, having the exterior paint & trim touched up, wallpaper removed, and bathrooms painted. 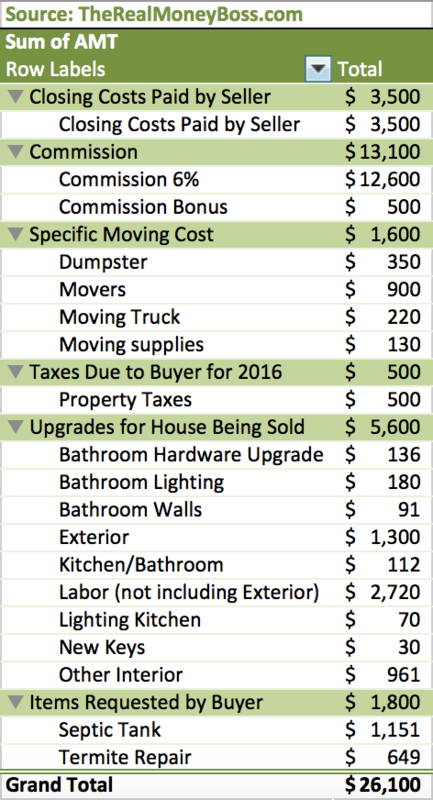 In any move you will want to take in consider how much it will cost you to move your things out of the Old Home and into your new place. Of course, if you are moving cross-country, or internationally this cost is going to be substantially higher. Budgeting for this really important as even in a short move you still have to pack all of your items and some how transport them. Also, one thing to consider when moving is that this is a great time to throw away or donate the items that you don’t use. I recommend including getting dumpster in this line item as well. Purging yourself of unused items feels so refreshing and is just that much less that you don’t have to pack up and move, and then unpack in the new house. We got a dumpster for $350, which included the company dropping it off, having it for 9 days so that we could fill it up, and then the company hauling it away. Since this move was only 35 miles the cost we got a truck for $220, and then hired 2 guys to do all of the heavy lifting of the furniture and boxes on moving day, which was $900 (including a $100 tip per mover). Also, we spent around $130 on moving supplies such as boxes, tape, & sharpies. 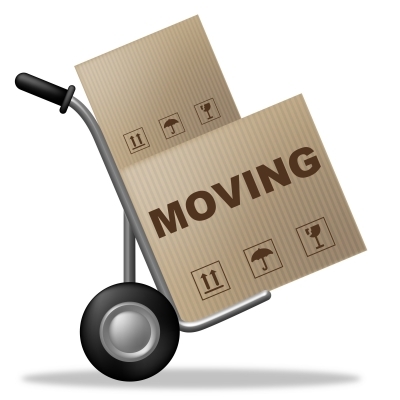 The total for the specific moving costs was around $1,600. Even in a brand new home, there are bound to be some issues that will come up through the inspection. These can be difficult to estimate for, because honestly if you knew about them before-hand then you would either A) need to fix them or B) disclose it. Even though this is difficult to estimate you will at least want to try your best to budget for it. For the house being sold that was built in 1993, there were a few issues with the septic tank. Being a seller our total cost towards these septic tank items were around $1,100 with the buyer paying around $1,000 as well. There was also active termites found on the property resulting in us paying $700 for termite treatment. Total we paid $1,800. At closing on the HUD statement there should be a line item including the seller’s portion of the property taxes. Even though you won’t own the house at the end of the year when a lot of property taxes are you due, you will still need to pay the buyer for your portion of the property taxes. Depending on at what point in the year you are selling this could be either a minor cost if the closing was the beginning of the property tax cycle, or it could be larger if it were at the end of a tax cycle. If you don’t account for property taxes at closing, then you could be leaving the closing with less an anticipated funds. Given that the 2015 taxes for the property being sold was $1,315, we are estimating $500 in the budget for this, as the closing is scheduled for mid-April, so that is 4.5 months of needing to pay property taxes. Most relators that I have worked with have a set document signed at the beginning of your working relationship that spells out that the seller’s agent (so your agent) will get 3%, and the buyer’s agent will get 3%. This commission all comes out of the proceeds due to the seller. This means that the seller is paying for this. You will want to budget for commission as a total of 6% or even higher for some agencies as this is a good chuck of the sale that you won’t receive. The house that we are selling is under contract to sell for $210K, so this will be $12,600 from the sale that we won’t be getting. Also, when we signed up with our realtor we opted-into an incentive bonus commission that this agent does to attract other agents. This bonus commission cost us $500, for a total commission of $13,100. Traditionally the seller is responsible for the closing costs; however, this can always be negotiated and on the sales that I have been involved, the buyer includes the amount they are expecting the seller to pay in closing costs on the original offer. There are different factors that come into play on closing costs, such as, mortgages involved, location, price of the home, and other factors as well. You will want to check with your realtor to see what they would estimate the closing costs to be for your house. In our contract it is stated that the seller will pay $3,500 in closing costs. Originally the buyer had asked us to pay for $7,000, but because it normally never hurts to ask, we countered back with splitting the $7,000 resulting in us, the seller paying $3,500, which the buyer accepted. We have not yet gone to closing for the sale of the old house; however, our realtor estimated in this case that it would be between $6,000 to $8,000 for closing costs. The other party is getting a mortgage on the home, and from our point of view there is no mortgage to be paid off on the seller’s side. Now let’s discuss the items needed to be budgeted for at the newly purchased house, where we are the BUYER. As the Buyer you will want to write in the original offer for the seller to pay as much of the closing costs as possible. If though you are afraid that another offer might come in, you still want to make this competitive to beat out another offer. Switching gears and talking about the new house that we purchased, the closing costs were only $1,935, as there were no mortgages involved, and the other factors lead to a lower cost. On those closing costs, we only paid $935, as the seller paid the other $1,000. Anytime you look at buying a property you will want to know how much the home owner association, or HOA, fees are and find how frequently they are due, which most are monthly or annually. Not budgeting for HOA fees could be a huge issue in the long term, in addition to the short term when budgeting for the move. Some properties require an HOA initiation fee that you will want to budget for when moving. The house that was purchased is in a community with a club house, activities, and includes lawn-care services. 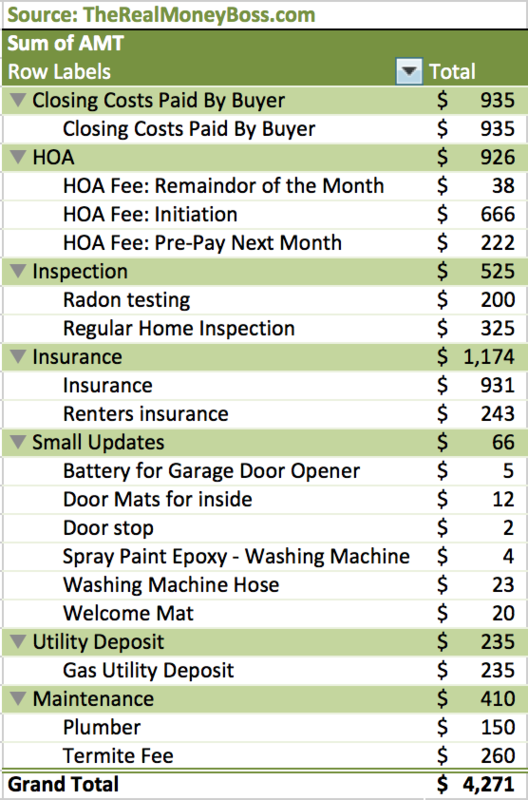 $666 was the HOA initiation fee, $222 was due for the pre-payment of the next month’s HOA fess, and $38 was for the remainder of the current month’s HOA fee. This totals $926, which shows that if you don’t take this into consideration when moving, then this could be a costly over sight. 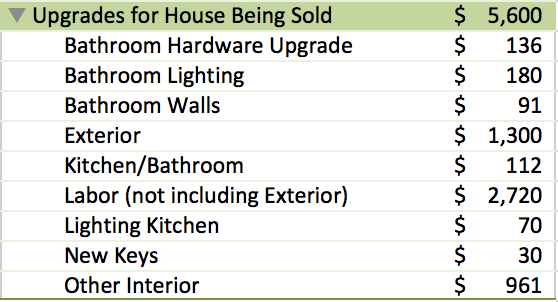 Whenever you buy a house you will want to get at a minimum just to make sure everything is in working order. A great thing about getting an inspection done is not only does it reduce your risk of having surprises when you move in, but also an inspection can result in being a good negotiation tactic for getting back and getting more money off the over all purchase price, as long as your expense of fixing the item is less than what you get off from of the price. There are also inspections that you might want to consider having done and budgeted for that are not covered by a general inspection; some examples are radon testing, septic tank inspection, and termite inspection. The general inspection cost $325. Also, we had a radon test, costing $200, done because we heard that radon levels in the area we were purchasing could be high. Total we spent $525. If you are financing your new home, insurance will 100% be required. If you are buying the property in cash, then it isn’t required, but highly recommended. Having insurance protects your house, and without it anything that goes wrong will be up to you to cover the expense of fixing. In order to get an accurate number to budget for insurance, call up an insurance broker and ask them to provide you with a quote. Because we are not the ones living in the property, we had to get two types of insurance renters insurance for our loved one living in the property and then insurance that covers everything else but our loved ones things. The total cost of coverage for the new property was $1,174. Getting into a new house means that there will be pesky little costs that can quickly add up to a large sum if you don’t watch it. If you are on a very tight budget, you will to need to make room for this in your moving budget. There were no door mats, and to help keep the floors nice we got some mats. Also, the garage door opener needed some new batteries. The washing machine was functional and had no issues, but there was a small rust spot that we touched up. The washing machine hoses were changed out, because they were almost ten years old and were the more likely to rupture rubber (not metal) kind. To help save a piece of furniture we picked up a door stop where a door was hitting the furniture. Total cost of our small updates was $66, which could be significant…you could easily buy lots of things with $66 (like a pair of shoes) so this is not pocket change! Depending on the rules of the utility company a deposit could be necessary. Checking this out in advance could save you a surprise. There was only one utility company that charged us a deposit of $275, because we were not going to be living in this home. Because maintenance of any home is important, if there are maintenance items that will be needed fairly soon after the move, you will want to go ahead and budget for these too. For a maintenance quote the companies that provide these types of services should be able to provide you with a free quote. As a result of our general inspection, it was found that the hot water in one of the showers was not working. Luckily, it was an easy fix for the local handy man/plumber that said it was a cartridge issue. It for a cost a total of $150 to fix. Also, the termite service expired the month that the house was purchased, so it was extended for $260 making the total cost here $460. There are still other factors that you will want to take in to consider that could effect the cost of your move, if there is a mortgage either to pay off on the old house or obtain on the house, closing costs will most likely be higher. Also, of course one major thing would be the difference in the prices of the homes that you are moving from and to.